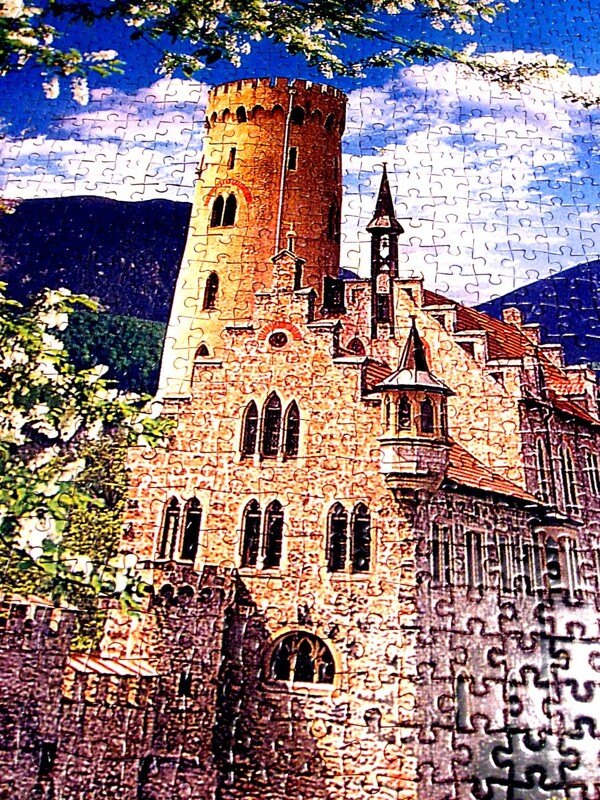 Have you ever gotten a tough jigsaw puzzle and been completely stumped? Do you get frustrated when you do one? 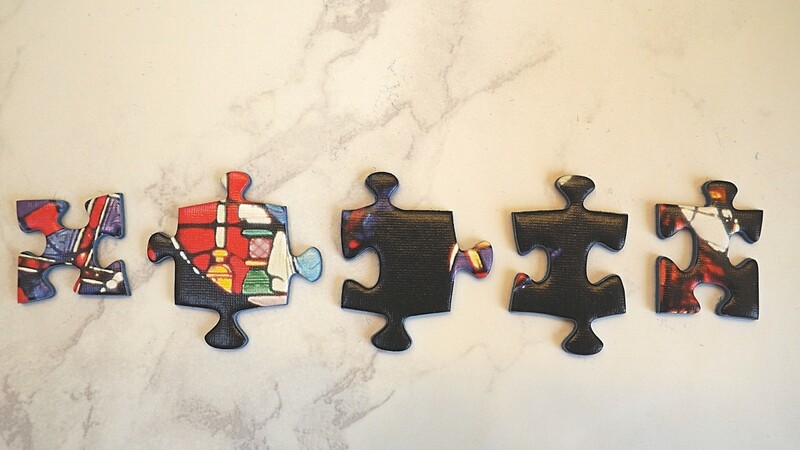 There are pretty much two types of jigsaw puzzle people. There are people like me, who love them and always have one on the table, and then there are people who really can't stand them, and stay as far away from them as they can. Whichever side you come down on, sometimes you need some help. There always seems to be that one section that you don't think you'll ever be able to finish. I've been doing puzzles for a very long time, and the more challenging one is, the more I like it. Over the years I have learned all kinds of tricks to get them done. So if you are a newbie to difficult puzzles, or you just can't seem to finish the one you are working on, here are some tips to help you out. 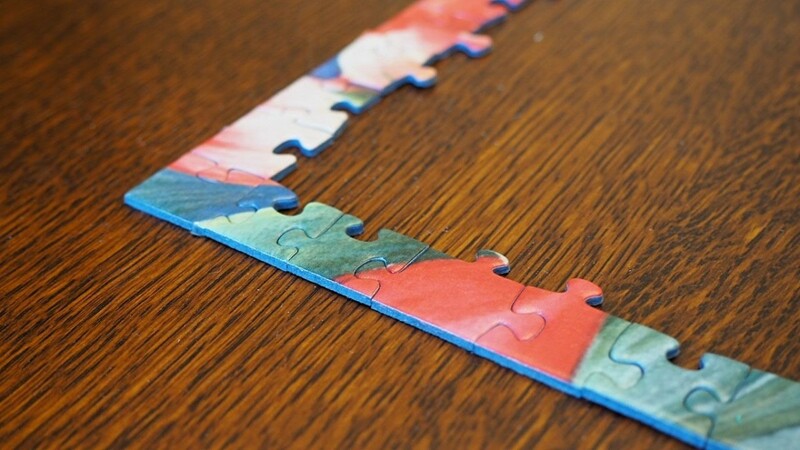 It takes a bit of preparation to do a puzzle, especially a difficult one. Sure, you can just pull pieces out of the box and hope that you find a match, but you will get frustrated pretty quickly. First and foremost, have a decent-sized workspace that will fit the puzzle you are working on. Once you have that, the steps are fairly simple. The first thing you should do when you get a puzzle is separate out the border pieces and assemble them. The border is a good starting point because it's not as difficult to put together, and it gives you a large area to build upon. Turn over all of the pieces in the puzzle. It's not the most exciting thing to do, especially when there are 1,000 pieces, but it's the only way you will be able to see everything. 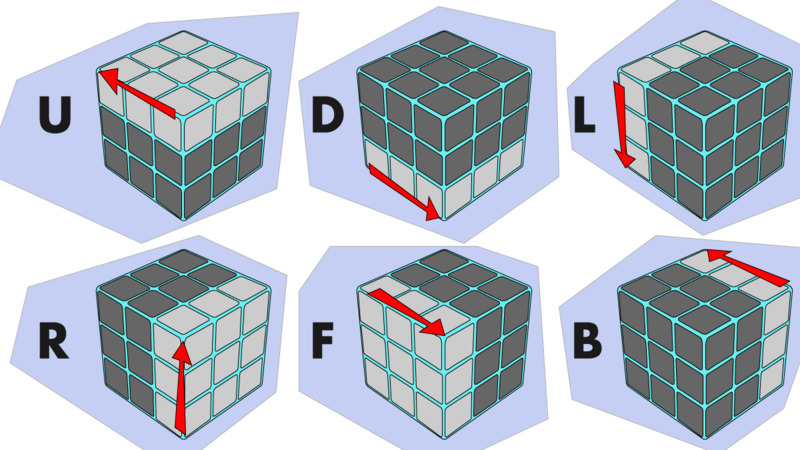 Most puzzle designs contain different colors. If yours does, then separate the pieces by color. This one step will help you more than you can imagine. 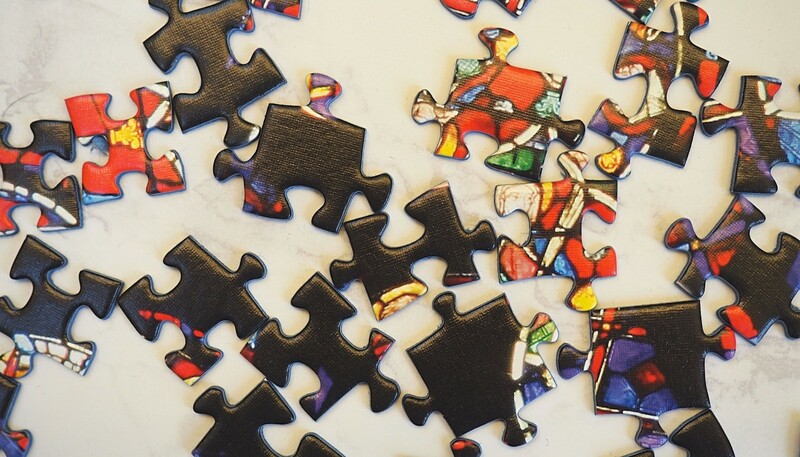 There may be a number of different sections that have the same color, and narrowing the pieces down by color makes finishing those sections easier. 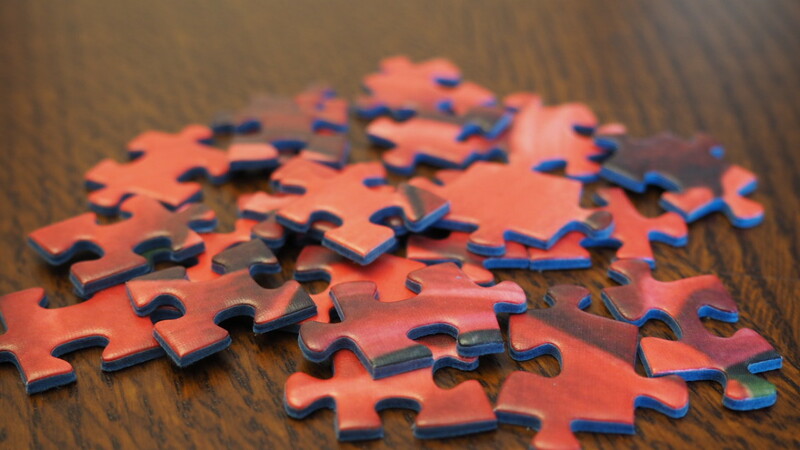 The first jigsaw puzzle was made by mapmaker John Spilsbury in 1767. 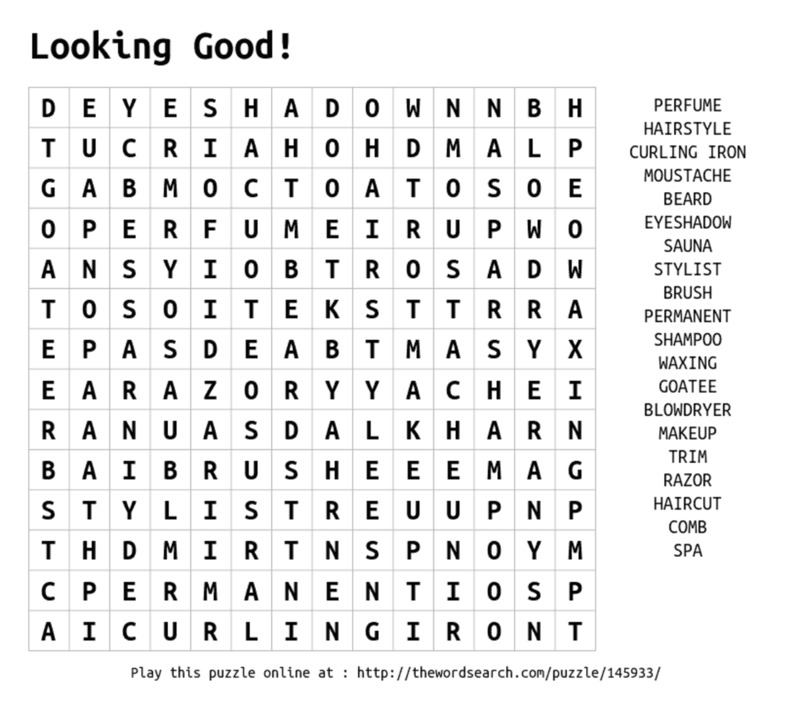 Take a look at the puzzle design. Sometimes it's the image, not the color, that stands out. Look for pieces that have distinct characteristics on them and separate them. 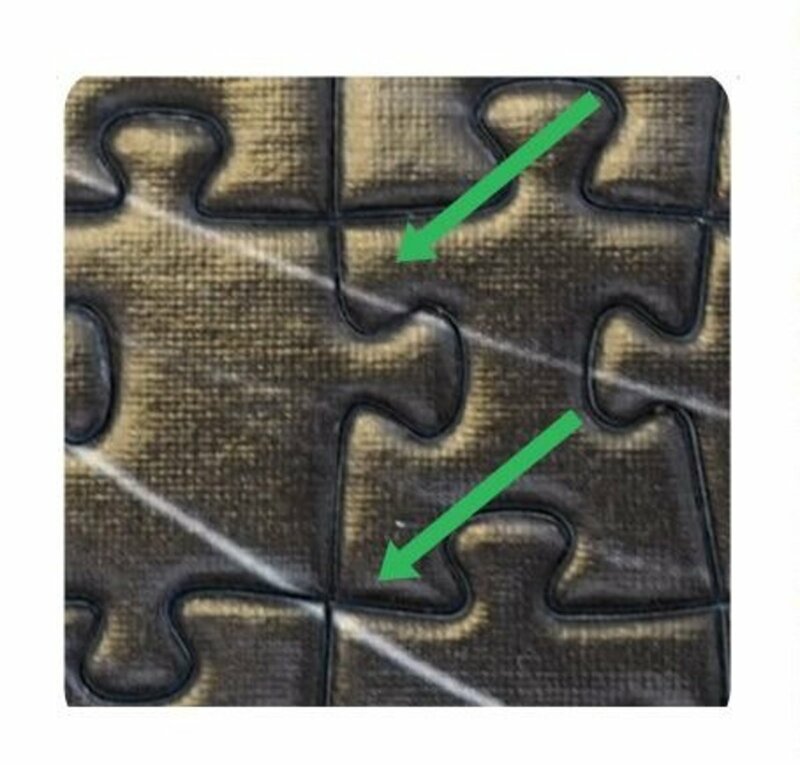 For example, if your puzzle has a grove of trees in it, then pull out pieces that look like they are trees and set them in one pile. Look for pieces with continuing patterns. 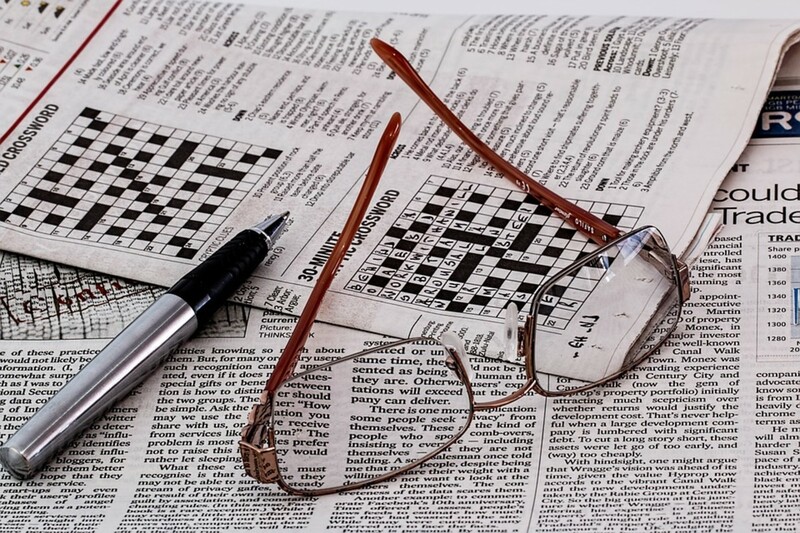 The puzzle in the photo above had large areas of black. Luckily some of the pieces had small white lines and those lines helped me figure out some placement. Use those continuing patterns to your advantage. 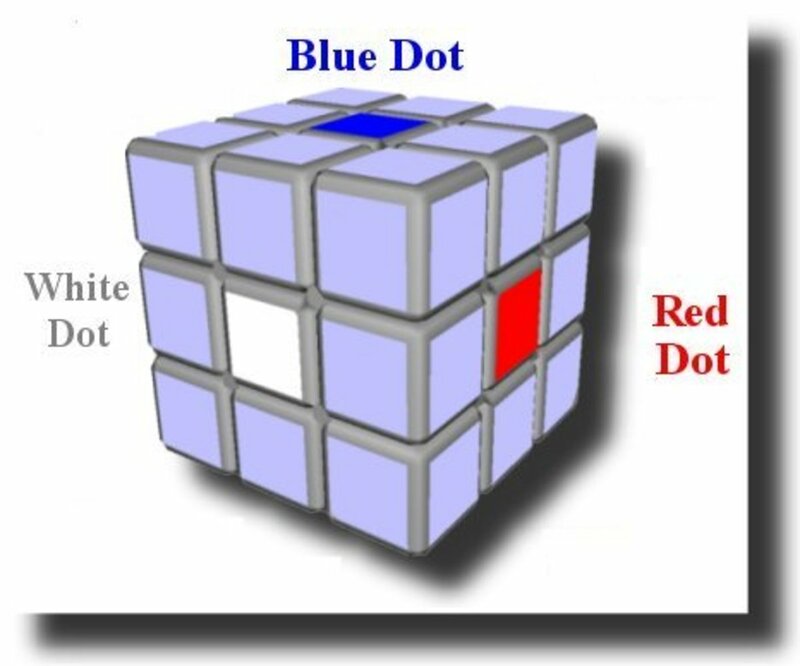 This is a trick that I use when I am getting close to finishing a puzzle, and am having a tough time. 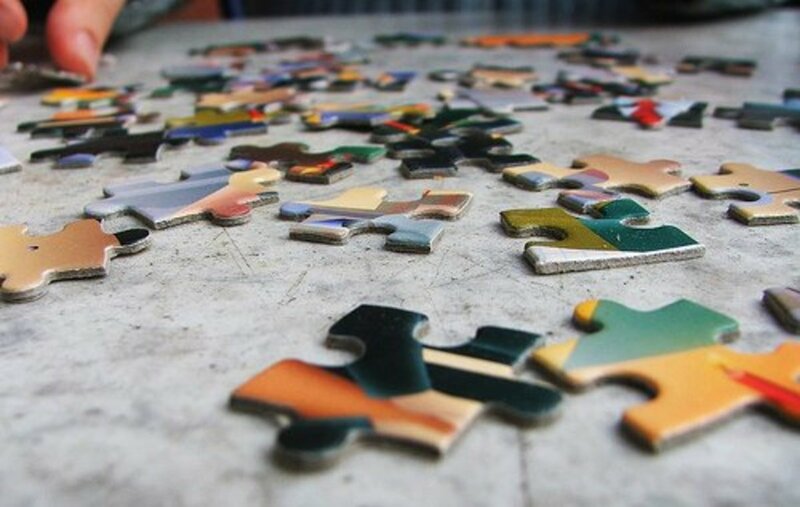 Most puzzles have various shaped pieces. Separate them into similar shapes. For example, bunch all of the ones that have prongs on all four sides together. It can help to look at the knobs and holes that join the pieces. They can also be called the prongs and slots. Some have distinctive shapes and they are another good clue to putting a puzzle together. This trick works well at any time, but especially when you are getting close to finishing. 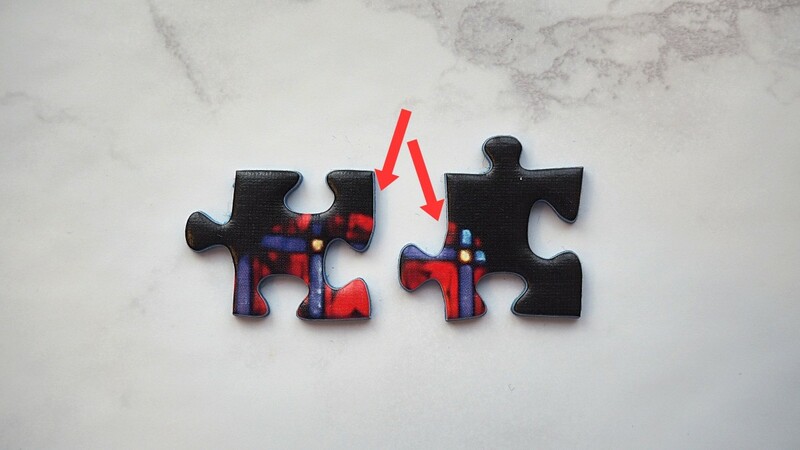 Depending on the puzzle design, perspective can be a good way to help you figure out where a piece should go. If the design has areas that are near and far away, like a stadium crowd, with people sitting up close and far away, use that to help you out. Step away from the puzzle. Leave it overnight or go do something else for a while. A fresh set of eyes will help. Try looking at the puzzle from another angle. Move your chair to the other side of the table. You get a whole new view of it. Make a game of it. Set a timer and see how long it takes you to put in a piece. Try to beat the time. Sometimes that added pressure can help. Big puzzles can be really hard to do. Sometimes you think that you are never going to finish, and it can be easy to get frustrated and give up. You may not even bother starting one because you don't think you can do it. 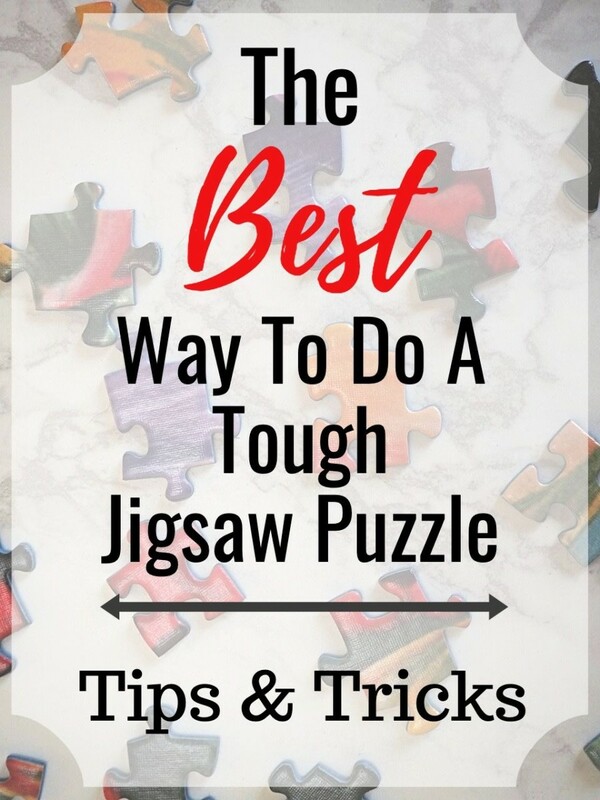 Using these tips and tricks should help you out, and you'll be finished with that tough puzzle before you know it. Thanks Dianna - I have a friend who does the borders last and I just don't understand how. Oh well, to each his/her own. We chuckled about it when I told her I wrote this article. I remember doing puzzles around the coffee table as a child with my family. It was such a great way to spend an evening. Doing the borders first is right on! Hi Robie - Nice to hear from you! Thanks for reading. 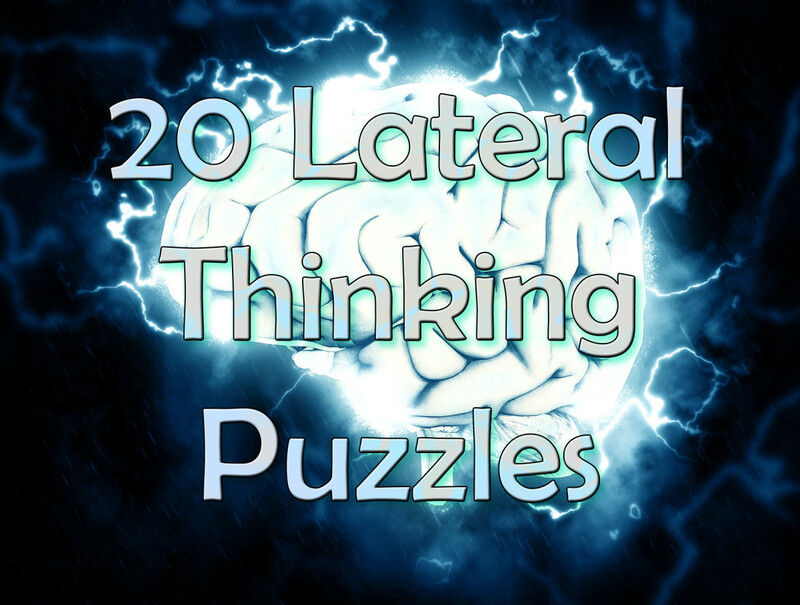 Hopefully this article helps lots of people do those tough puzzles. Thanks Tessa - I appreciate it. I don't think you can go wrong with these methods. I just finished one this morning and it was down to the black pieces only, no identifying marks. It took a while. Hi Poppy - Yep, your mom and grandfather were right (at least in my opinion). Thanks for stopping by! When I was a child, my mother and grandfather always got me to start with the corners and outside pieces.